It shouldn't come as a surprise, considering more people use public transit in Montreal than in Toronto, despite its smaller population. Couple that with the smaller land area of Montreal, and you have a city core with more people not using cars -- i.e., walking. Ste-Catherine St. is Canada's busiest commercial avenue. By the way, Ellington/Yonge is the busiest. Yonge/Dundas only LOOKS busy because of its layout. Nope, more people in Toronto use public transit than in Montreal. Streetcars and busses are also public transit, and Toronto's total ridership is 3rd in North America after NYC and Mexico City. The residential density in downtown Toronto is higher than that of Montreal and is getting higher every year. Tens of thousands of additional units are currently under construction and tens of thousands more are approved and proposed. The study that concluded Yonge and Eglinton is the busiest pedestrian corner is flawed because it counted people on different days and different times of the year. 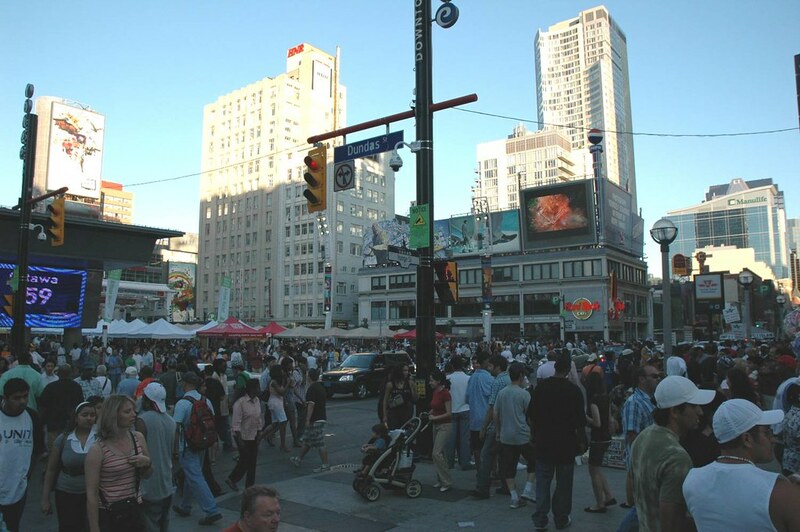 For example, it also said that Bay and Dundas was busier than Yonge and Dundas because the count for Bay and Dundas was done at a warmer time of the year while the count for Yonge and Dundas was done in the winter. Anyone who lives in Toronto and walks around the downtown area knows that Yonge and Dundas is by FAR the busiest intersection in the city for sheer pedestrian volume. Damn you have a good eye Atticman! Montreal has a busier subway system which I think our friend from Florida was confusing.. Toronto's combination of Streetcars/busses/Subways and Regional Heavy rail easily outguns Montreal for number 3 busiest PT system in North America after NYC and Mexico City..
Further to your last point agreed... The study quoting Yonge Eglinton threw me for a loop but the link below further reinforces what you've stated and I completely concur.. Yonge and Egs is undeniably a busy intersection but Yonge Dundas rules.. Anyway, both of us know this is not an atypical Summer Day at Yonge/Dundas where events/concerts going on all the time are normal - not out of the ordinary. People have a vendetta against Toronto, I swear Toronto is high on my list of places to go may sound strange but something about the city really appeals to me. I'm glad you've noted that P London... Some of us from T.O are kind of thrown off at this but there is some truth to what you're saying.. T.O does have its fans though so even though you get this vocal group for whatever reason(s) have this vendetta - it is just that a vocal group and not everyone.. I think T.O is an appealing city objectively.. It has more than meets the eye in terms of just scrapers and suburbia and that more is easy to find in Old Toronto.. As with any place, if you do come, come with an open mind and if you can link with a local who knows the city and shares similar interests to you, I think you'll enjoy what the city has to offer.. London or NYC it is not, but appeals it most certainly has. Yep, and as any downtown resident knows, even if there's no concert or event in the square the area is still jammed with people on a nice day. Well and if you visit Montreal in the dead of summer vs a visit to Toronto in the dead of winter - sure the streets are going to be more vibrant and alive in Montreal... Such is the reality of things in places with more extreme variations in temperatures. I've also seen some sweet mockups of plans for the Toronto waterfront in the past. Anyone Torontonians want to post any updates on that? I have noticed I really don't know why the city gets so bad rep but as I said I can guarantee that very soon I'l be hoping over to Toronto especially as I'm getting some paid work soon. Better save up! Its kinda strange, ... I'd certainly love to visit there. All are great and vibrant cities. I think if there is one that I would find the least interesting it would be Sydney. I've always heard that Sydney is sort of like a large Vancouver............your typical blond, beautiful on the outside but nothing in the middle. Sydney, a beach resort? Trust me, its a city. Yeh, the harbour provides a beautiful setting, and there are quite a few locations nearby, like the Blue Mountain and Ku-Ring-Gai Chase NP, that are pretty nice. But I doubt anyone would rank it along side places like the Gold Coast, Noosa, the Whitsundays or Margaret River as a chill out beach destination.